This image has been reduced by 44%. Click to view full size. I am proud of that piece. 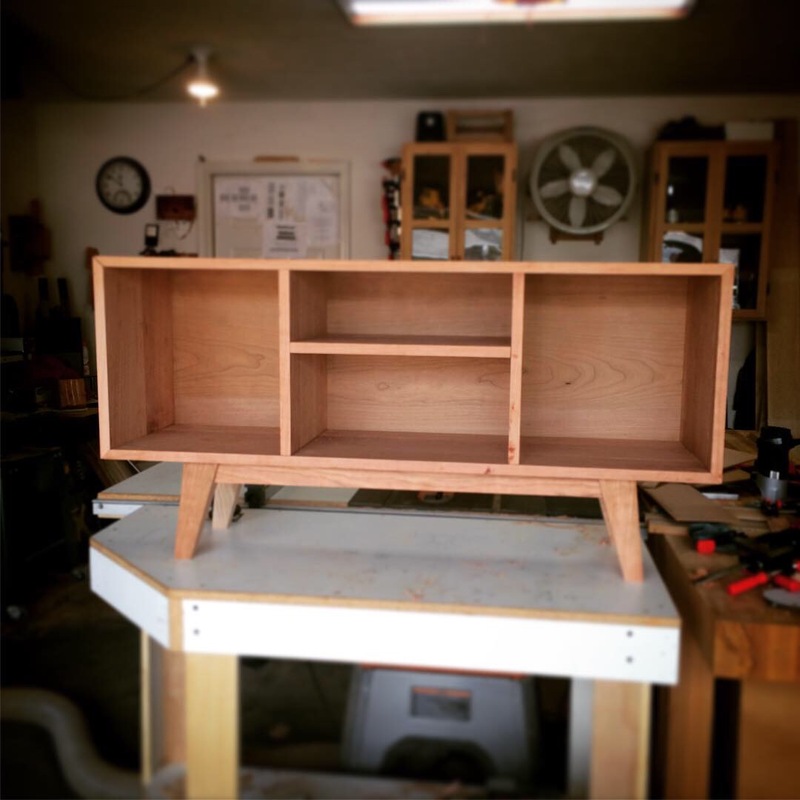 It was the first time I ever tried to do nothing but best practices in my woodwork. Lots of hand-tooling, lots of hidden and half-blind dovetails, lots of creative crazy joinery. It's holding up quite well, too, and I liked it so much that I decided it needed a friend. This image has been reduced by 25.3%. Click to view full size. 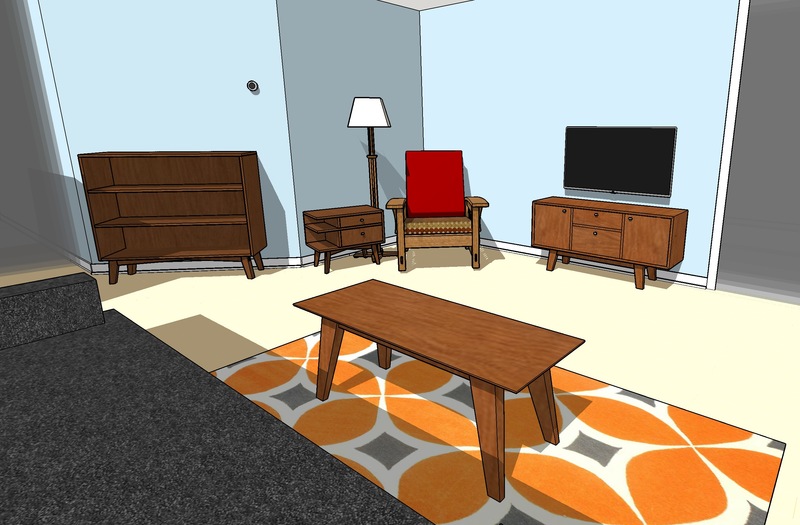 The TV stand, bookshelf, and coffee table are all new, while the other stuff is existing. I know a mission-style white oak Morris chair doesn't exactly go with a bunch of cherry midmod stuff, but I'm keeping it for sentimental reasons. 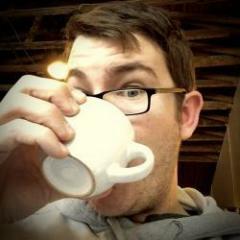 This image has been reduced by 31.6%. Click to view full size. On the original side table, I was trying best practices with no regard to how long it took, and that tiny table took about two months as a result. It turned out GREAT, but that's a long time, and I've got commissions to build after this. Gotta make money somehow. So the way I'm looking at this project is that I'm trying to see how quickly and efficiently I can make a piece that I'm proud of without sacrificing too much quality. 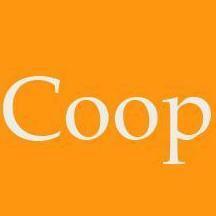 The project is an exercise in "compromising without compromising," so to speak. 1. No buying new material. 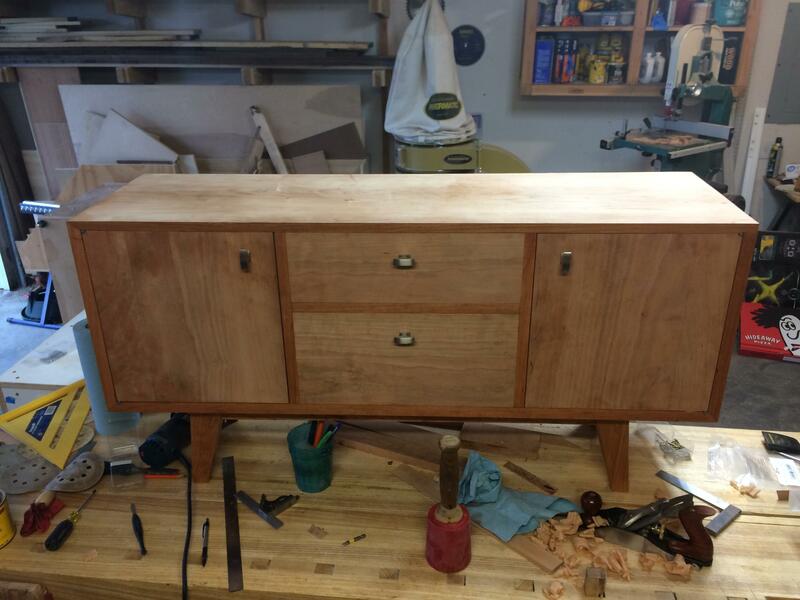 So far so good on this one, I had just the right amount in the shop for the case, doors, and drawer fronts. I did have to use sapwood-heavy boards on the interior, but nobody will ever see that in daily use. I also had to use a board that had a half-inch bug hole through it. 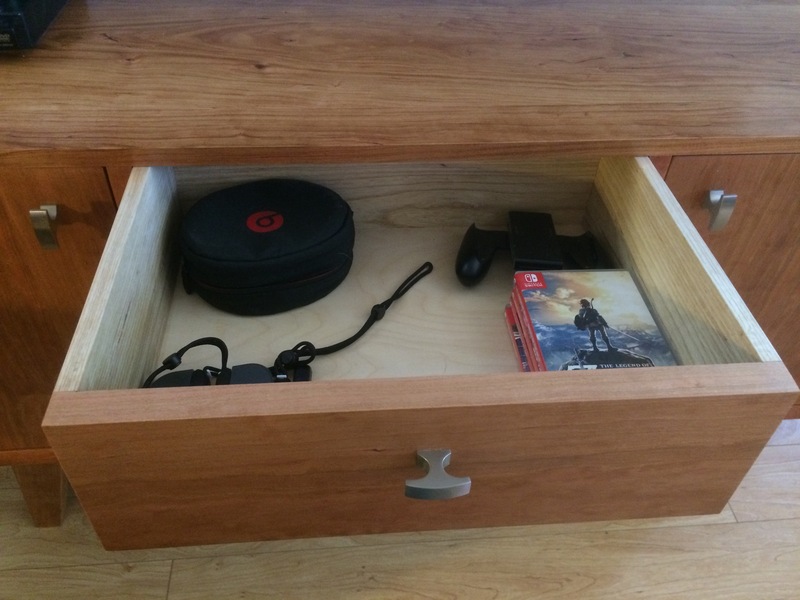 It's also on the inside - it'll be the surface that the top drawer rides on top of. I filled the bug damage with epoxy, and nobody will ever be the wiser. Everything on the outside is looking good. I did have to do a few panels with three boards when two wider ones would have been preferable, but I'm working with limited stock here, and I'm keeping it pretty symmetrical, so it's not a major loss. 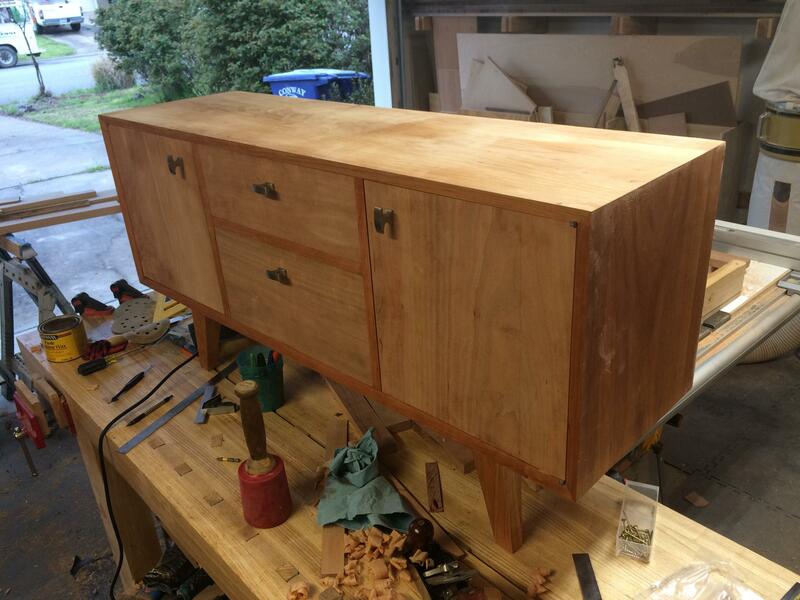 One compromise that I'm somewhat okay with is that the back panel is actually ¼" cherry-veneered MDF panel. 2. 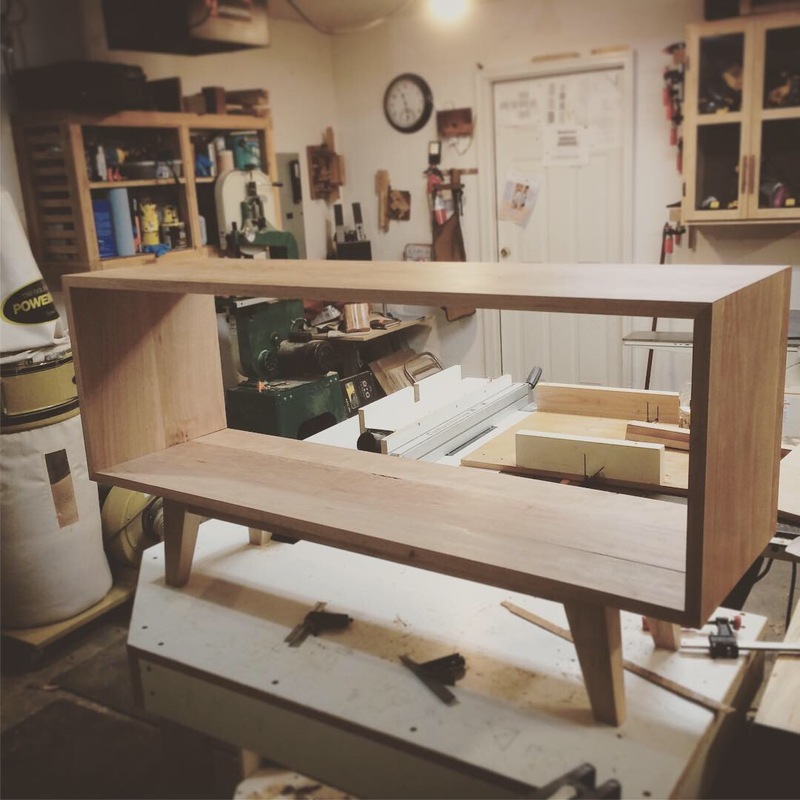 No overly complicated joinery. 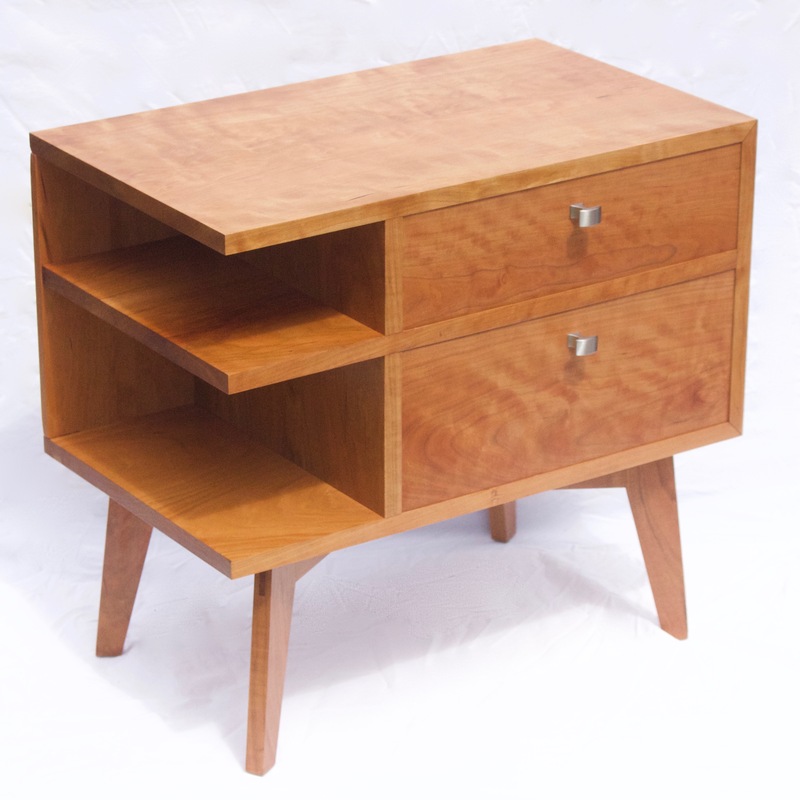 On the original side table, the miter joints featured blind mitered dovetails. Those took FOR. EVER. And they look great and were a dream to glue up, because everything came together perfectly, but I'm not sure how much of a payoff there will really be. For this one, I just cut the miters on the table saw with a sled and used biscuits for alignment. On the original, the vertical components were held in place by sliding dovetails in the top and bottom of the case. 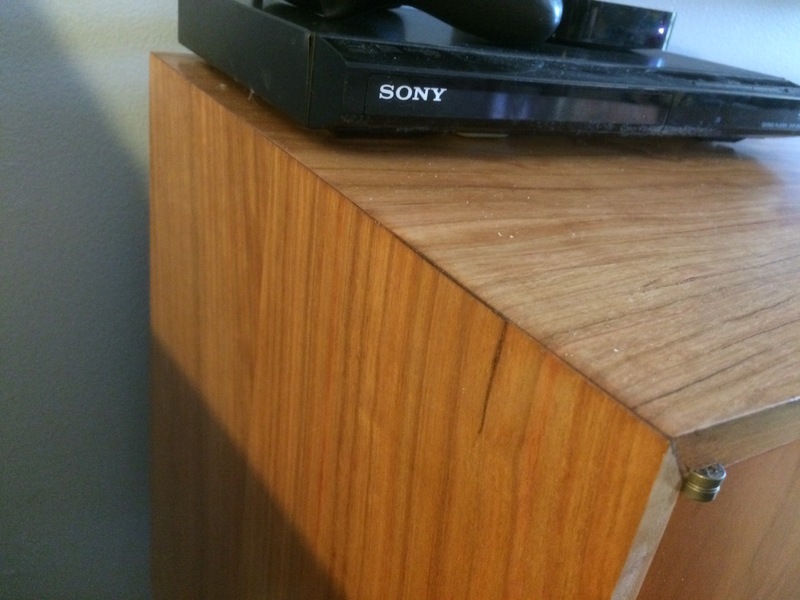 In the TV stand, they are just held in by a simple tenon in a groove. 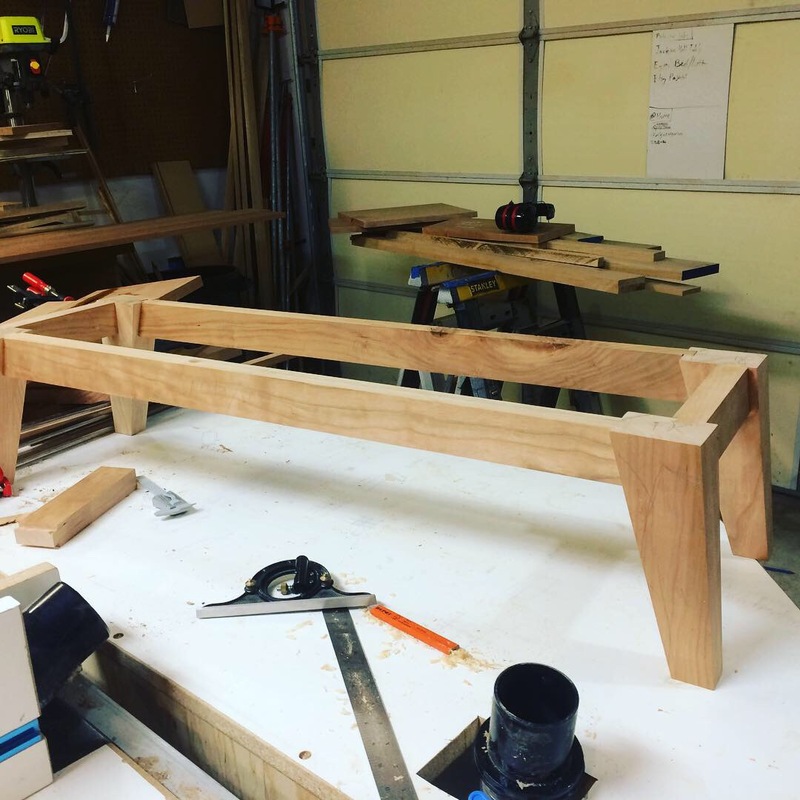 Simplified joinery, but not to the point it will be weaker. 3. Fastening hardware is okay. I'm attaching the base to the top with screws up through the base into the bottom of the cabinet. On the side table I did a crazy sliding dovetail thing - a very cool magic trick for woodworkers to ooh and ahh over, but it actually doesn't really help the piece in use, and it took forever. Screws where they will work better faster and never be seen? I'm in. 1. 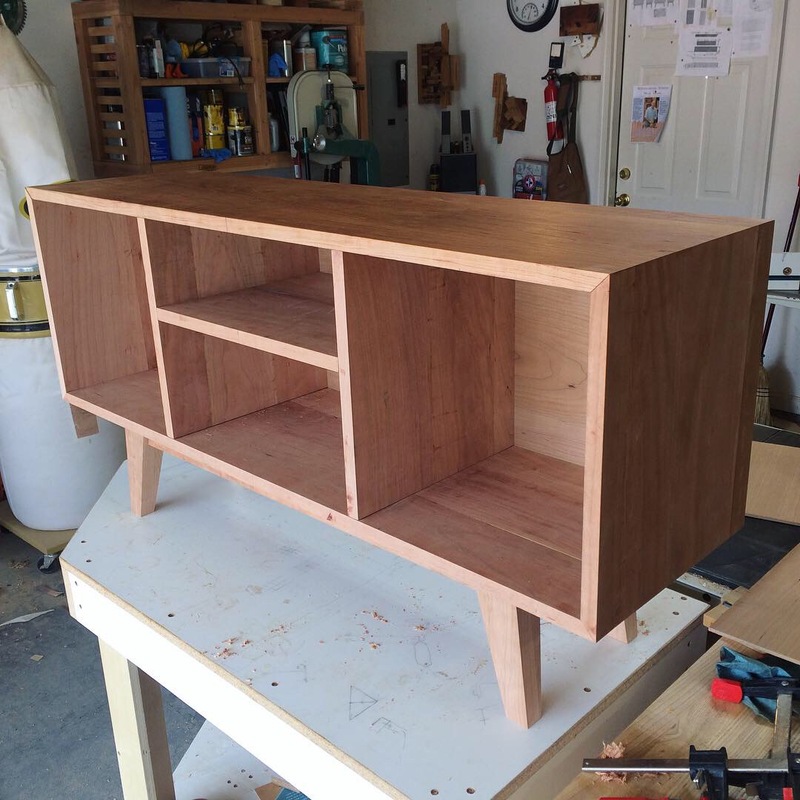 The joinery will still be solid. It'll hold up to everyday use. And it will look good doing it. 2. The wood will still be as-well-selected as possible in spite of trying to avoid buying new material for this project. It's all pretty decent cherry aside from the defects deep inside the case, which will be invisible during ordinary use. 3. The hardware is going to be niiiiice. 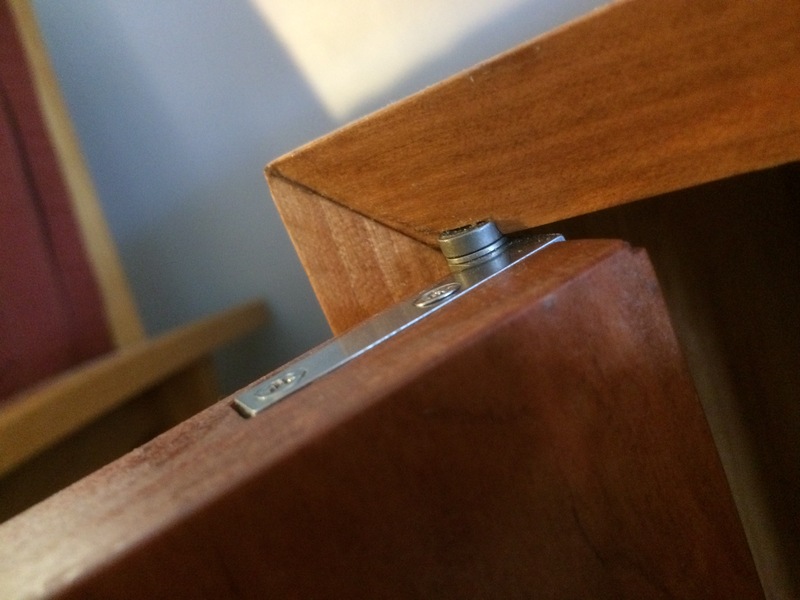 I bought the stainless steel knife hinges from Lee Valley and installed them in the case prior to glue-up. I just ordered ball catches from Brusso (via Amazon) and will use those to lock the doors shut. 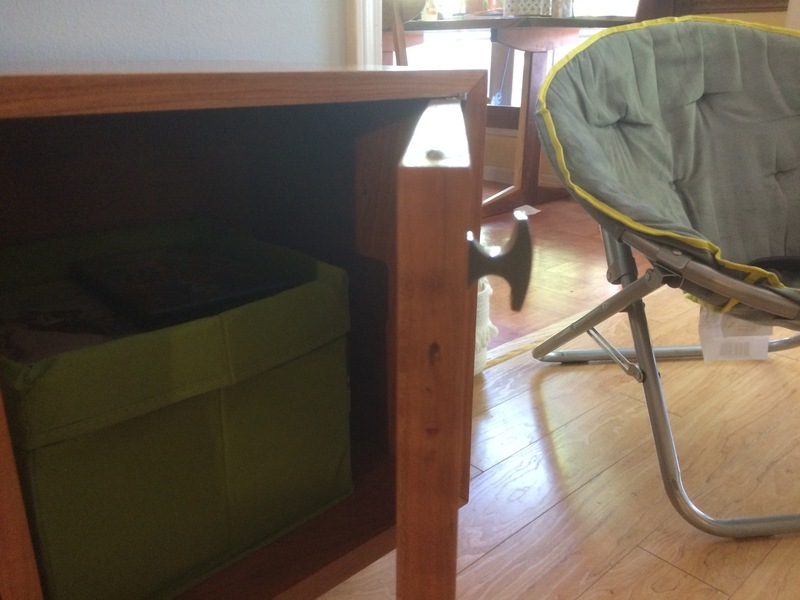 I've already got my handle hardware - it's as close as I could find to the hardware from the original side table, and I think it'll look great. The legs and stretchers went together without a hitch. 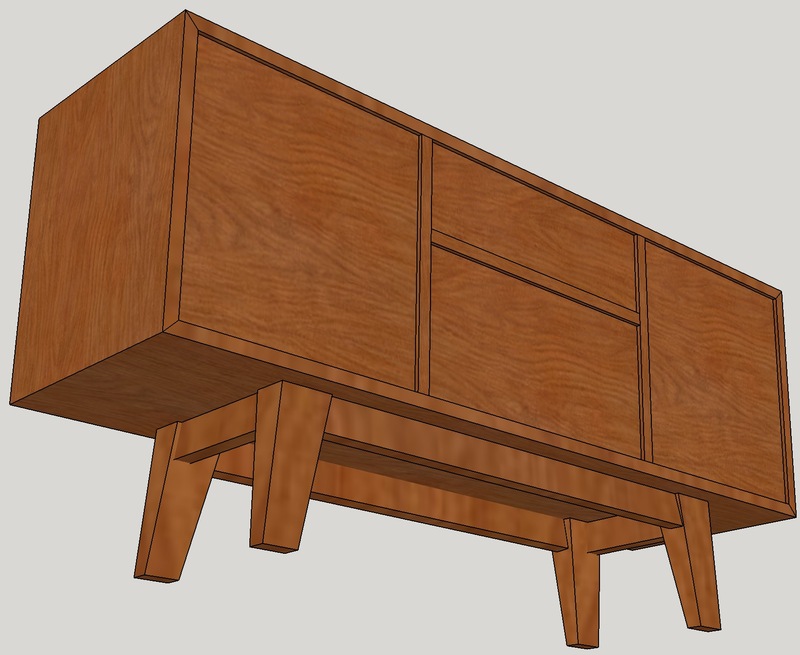 Simple enough, just vertically-oriented sliding dovetails into the tops of the legs. This is the fourth or fifth time I've used this technique for attaching legs, and it's become one of my favorite techniques. It's just so solid. 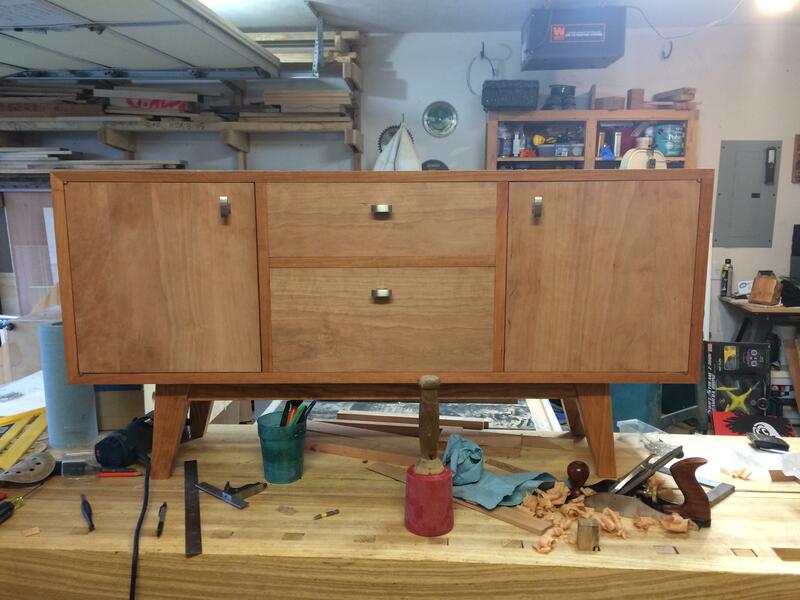 This photo was prior to final glue-up, but it looks essentially identical right now. Testing the miters with the biscuits. It went pretty well for the most part. There was a little trouble during the glue-up, but that may be a different post. Definitely easier overall than the blind mitered dovetails, but the glue-up sucked a lot more, haha. That little bit of detailing is really making this piece feel pretty great. So yeah, that's about where it's at at the moment. So, here's where I'm at from here. I've got the door panels glued up and I've got the drawer-fronts selected and rough-cut to size. I am going to take a walk in the danger zone and make my doors be solid wood panels. I figure that the worst that could happen is they get stuck, and I have to trim them - or they warp into potato chips and I have to scrap them and make new doors. Honestly, that wouldn't be so bad. I mean, I'm a woodworker. I've never done solid-wood doors, and this cherry seems quite stable, so I'm giving it a go. I think it'll look good with the modern style. For the interior of the drawers, I'm waffling back and fort between ash and maple - mostly because I have a bit of ash on hand already, but I'm not sure if it will be enough to make what I need, so it may just come down to whether I have enough ash on hand. If I don't, I'll probably buy maple just because it would look better with the cherry. Keep getting splinters, fellow termites. 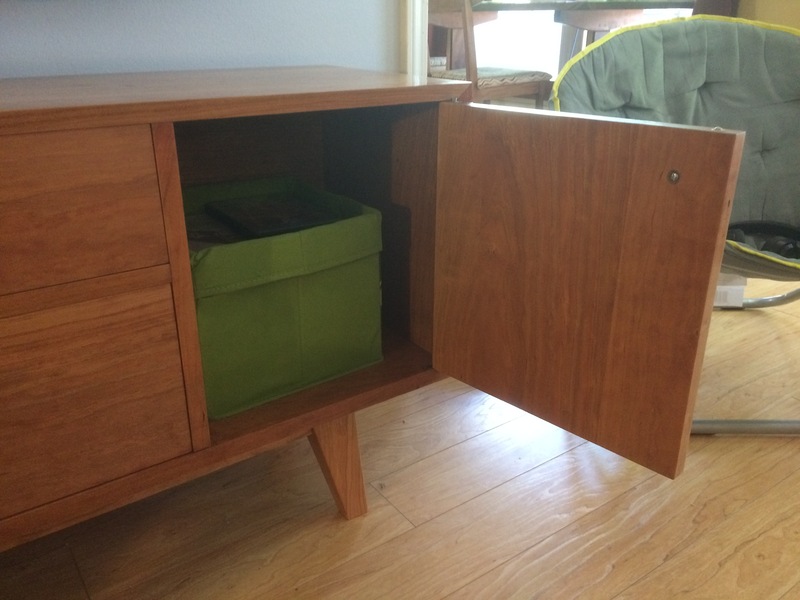 I know a mission-style white oak Morris chair doesn't exactly go with a bunch of cherry midmod stuff, but I'm keeping it for sentimental reasons. "doesn't exactly go" has gone and went at my house. I employed the thinking some time back that if I saw something I liked and it looked like it would be something fun to build, then it goes on the list of projects. So over time, everything looks nice but nothing matches. I like the progress. The slab doors could look really cool and it appears that you are putting a lot of thought into the process. I don't know what material cost is for you but if you are concerned about looks interior wise I'd stick with cherry. For me at least cherry is about the same price as maple and ash maybe less. The only reason secondary woods were used was to save the expensive wood for the part that shows. For some reason soft maple or poplar isn't all that affordable from my source. 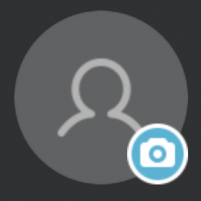 This image has been reduced by 7.4%. Click to view full size. The doors are hung and the hinges are in place. 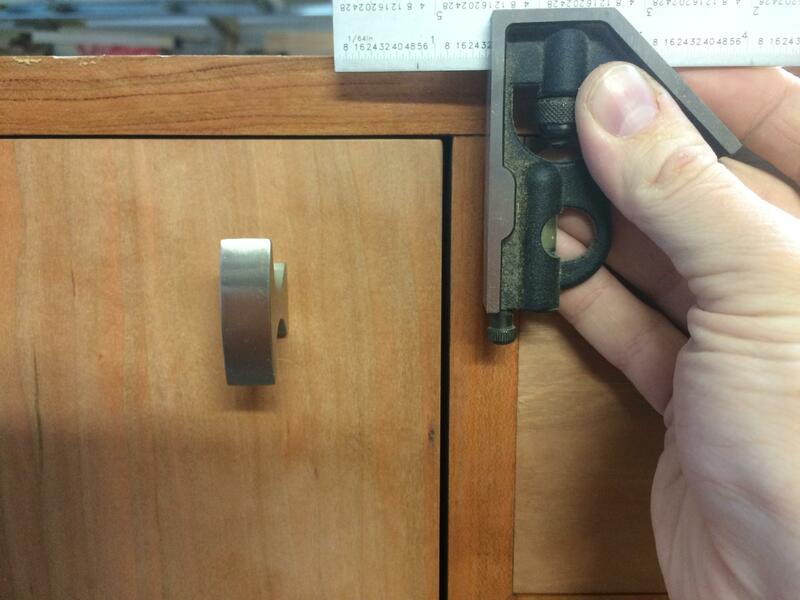 These hinges are incredible. I 100% recommend them to anyone. Lee Valley knife hinges. Pricey, but still half of what Brusso charges. Brusso's prices are insane, whereas Lee Valley's are just mildly silly. The handles are in place because I wanted a way to open and close everything - darn difficult, as I discovered the first time the door closed with the hinges screwed into place. I ended up having to stick a hook in the gap around the door, turn it 90 degrees, and pull it back to open it. Sheesh. The drawer fronts are just cut to size, there aren't drawers on there yet. 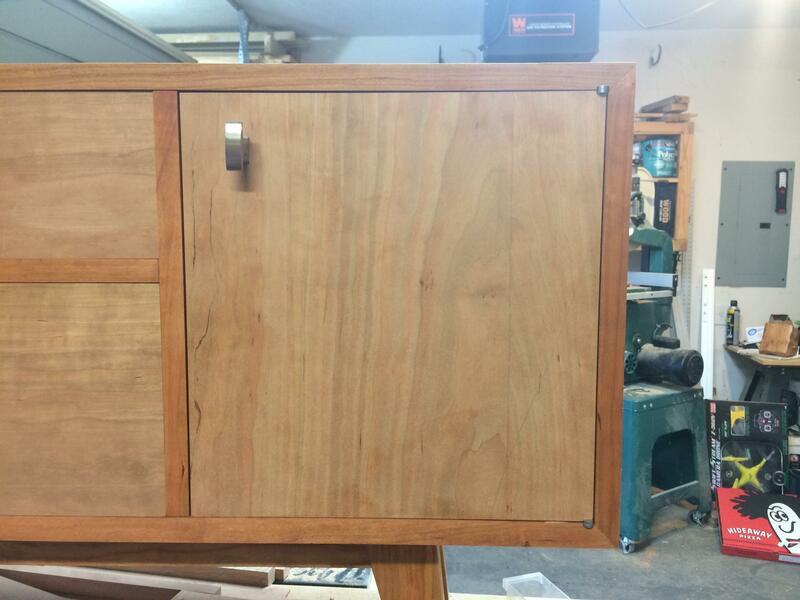 There is zero clearance around those drawer fronts - the clearance will come as needed while making the drawer body. Not much to say about how this gap happened. 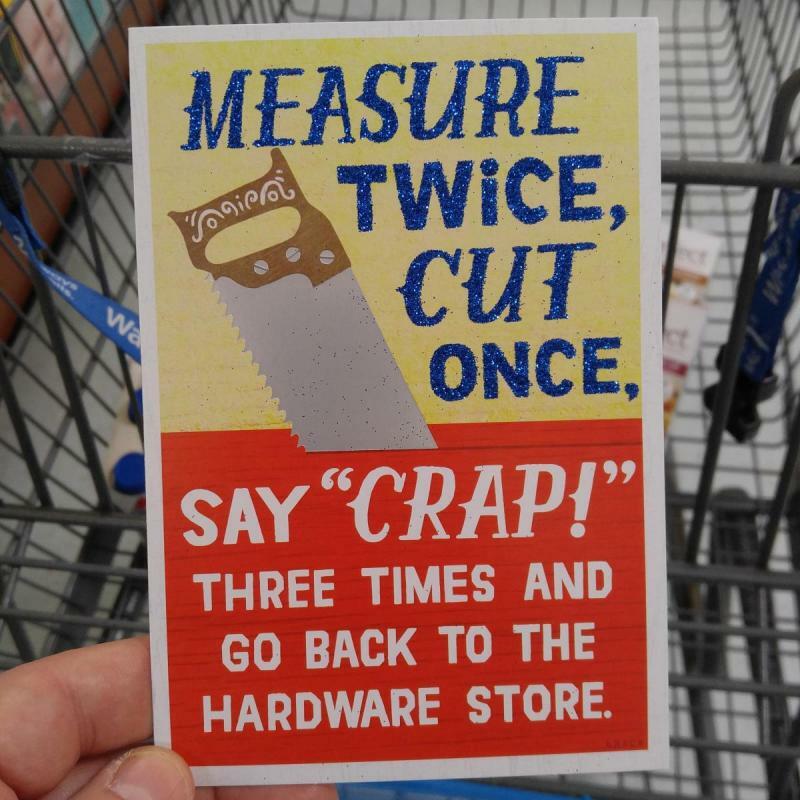 A classic case of needing to measure twice and cut once, I'm afraid. I'm considering my options to correct it. One idea is that I could try some sort of edge profile on the outside edges of the doors - that might obscure the gap, but then again it might just make it all the more noticeable. 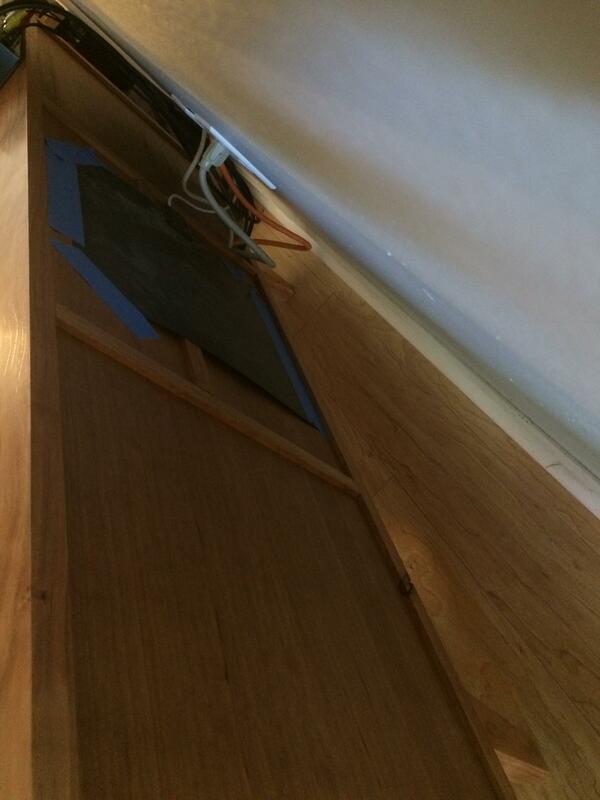 Another is to glue a thin vertical strip onto that edge of the door - one perk of a solid panel door, I guess. I'm leaning toward that option, it seems less risky - I still have the offcuts from cutting the door to width, so it wouldn't be hard at all. Just a matter of doing it, I guess. 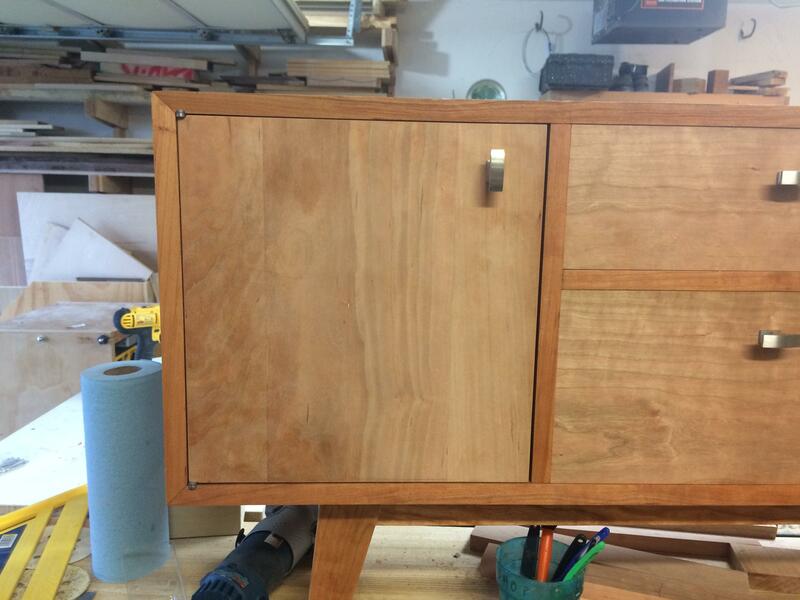 As for the grain on the doors and drawer fronts, I'm pretty happy with the way it is all coming together. 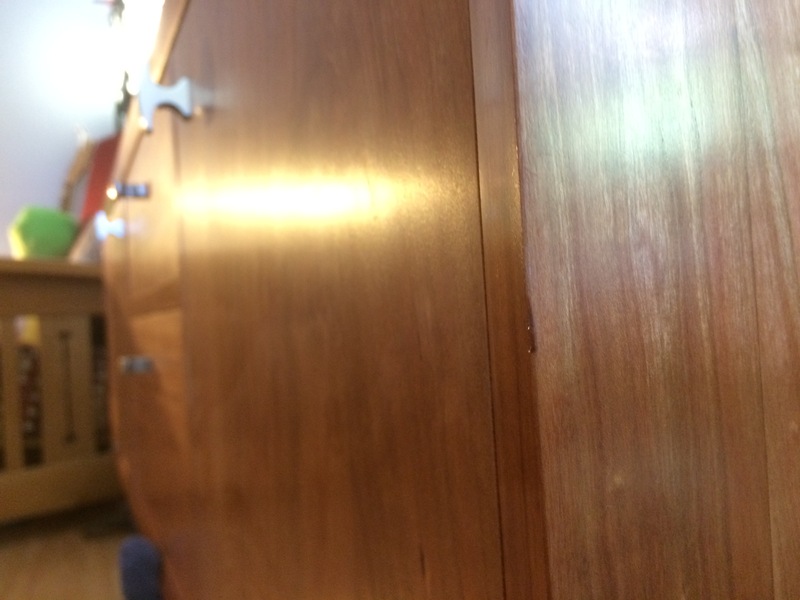 The panels' joints aren't that noticeable, and the drawers and doors appear to be a very close match in general color. I ran out of linseed oil a couple of days ago, so I need to pick some more up - that is why the doors & drawers are so much paler than the rest of the cabinet. I treat my cherry with BLO before applying polyurethane. It works really well for me. Dang nice job bud! Your wife will never notice the gap difference and if neighbors come over with a tape, give them another beer and turn up the volume on the tv and ignore them! Just make the gap on the other side match? It's dry season moving in to wet season for me so by mid summer the gap would be consistent. Not sure about that down in Arkansas. I grew up with MCM in the house till I was 8 or 9 and the move to darker, heavier stuff hit. Your piece takes me back. Nicely done. I have learned (mostly) to not mention the things that most folks won't ever notice (but, I still see them from across the room). Great look, dimensions and stance. I really like it. Really nice!! Show us the back? An interesting video and running commentary. A couple suggestions that I couldn't help noticing. Both center around the use of your table saw as a work surface (who doesn't do that from time to time). If I'm going to be banging on the surface of my saw I like to use some kind of protection, like a router mat, to protect the table so I don't mar it any worse than normal wear will. If I'm going to be gluing on the table I'd first clean off all the loose sawdust so I don't contaminate the joints and then I'd put down some sort of barrier, a tarp or drop cloth, so that I don't get gobs of glue on my table. Otherwise, I'm sure there's useful information in there for someone. Looks great! I see another familar piece or two, as well. Nice work. It looks great in place. 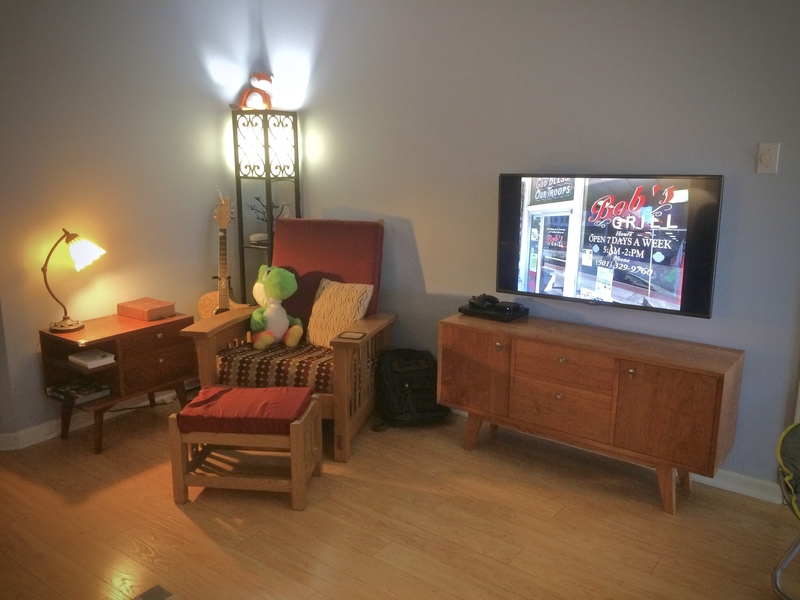 Everything here is my own design and construction aside from the lamp and the guitar. The chair was built with my dad circa 2009 when I was learning how to make furniture. The footstool was made on the porch of my apartment in 2012 when my wife and I first got married. The side table was made in 2017 when my son was born. I'm focusing on the nicks, dings, and imperfections in this post. Here's one. I noticed after the finish was far enough underway that sanding it back would've led to inconsistent color or completely restarting the finish. I figure that with a toddler, this is the first of many dings, haha. The right door went on very well - consistent 1/16" reveal all the way around. The left door has a bit more of a problem with the reveal - the right edge of it is a bit too wide, probably ⅛ instead of 1/16. The top is also tighter than it should be, which in turn emphasizes the oversize gap on the right. 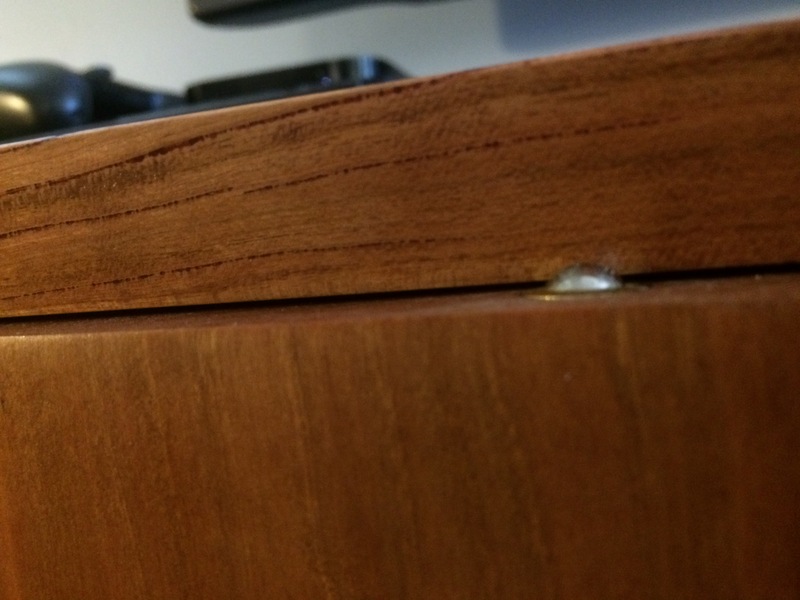 When I was gluing the case up, something weird happened that I still can't figure out, and when I clamped it there was a split here - it's the dark vertical streak about ¼ of the way in from the front. I filled it in with glue & sawdust, and it is hidden with the grain well enough, but it wasn't a perfect project. The miter joint right there ended up being a tad gappy, too. I guess there must have been a chip or chunk of something in the joint that caused it to not want to close evenly, leading to a split when put under heavy clamp pressure. Yeah, I over clamp. Guilty as charged. The only visible sapwood. There's a little more on the bottom of the cabinet. Also, I'm trying to figure out how to manage my mess of wires in this cabinet. It seems like a shame to waste so much space, but I'm also only just figuring out what I want where in this thing. Our previous "TV stand" was actually a repurposed coffee table, so having somewhere to put things is a new experience, hahaha. The Lee Valley offset knife hinges I used for the project were pricey, but overall very good quality. They ended up sitting just barely proud of the surface after trimming the doors to fit as well as I could. Also, there's a nick out of the corner of this door because I got reckless when trimming early on. I hid it, but it's still there! Every ding tells a story, I guess. Most are just stories of my own stupidity, but still. lol. I used Brusso ball catches to hold the doors closed, but didn't anticipate this: The ball catch has a travel of almost ⅛", and my reveal is about half that. This means that over time, the ball catch is going to put a little crescent-shaped ding into the wood where it compresses each time. Not a major concern, but something I overlooked. It was my first time using ball catches, so I guess that is something to remember for next time. Top drawer! Video game goodies. 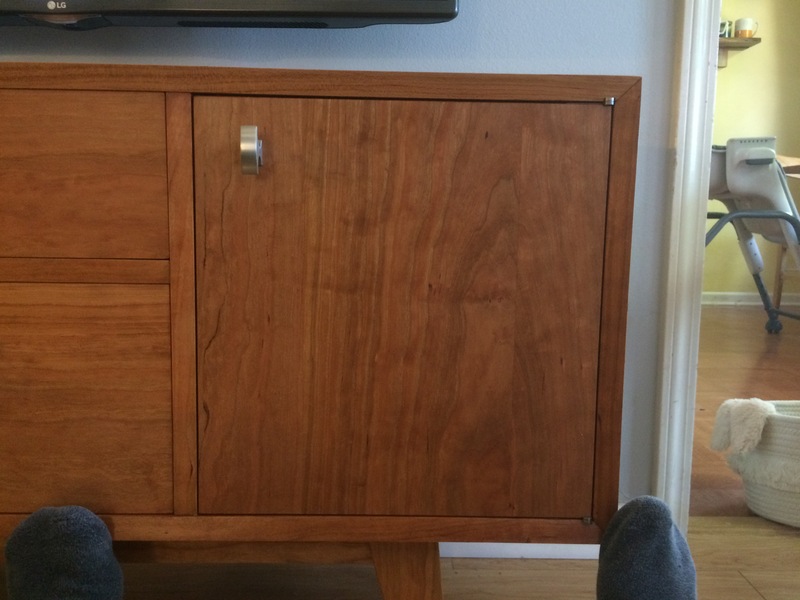 No real problems with this drawer. Bottom drawer! DVDs. So nice to finally have somewhere to stash them. 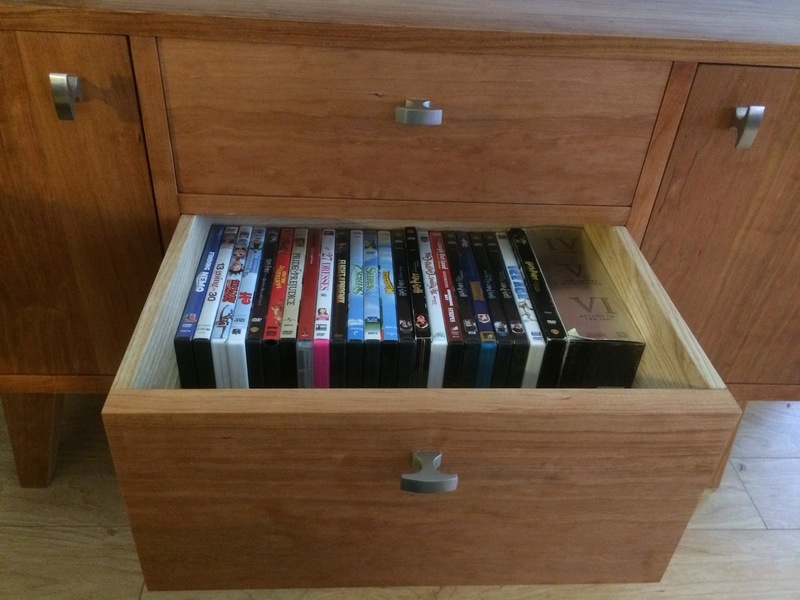 I purposefully designed the drawer to be deep enough to hold DVD cases. The right cabinet currently holds one of those felt storage cubes, also full of DVDs. Funny how those accumulate. I can't remember the last time I bought a DVD, but somehow there are so many of them. There has been some discussion about the potential for the doors warping since they are solid wood. They are also nearly an inch thick, more like a tabletop than a door. I think they should be okay, but if they aren't I can fix them as needed. Time will tell. This photo also shows yet another goof-up, a hole I had to drill to remove the ball catch when I accidentally put it too deep. 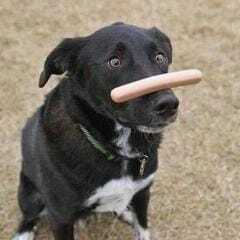 Those ball catches are tricky. Raking angle shot of the top surface finish. I am pretty happy with it! This image has been reduced by 18.5%. Click to view full size. The back. It's got my TV antenna taped to it (yes, I said TV antenna, we use Netflix, YouTube, and over-the-air local channels), and one hole for cables to go into the far cabinet. Not pretty, not ugly, just "mreh." It's a cabinet back, whatchagonnado. Nicely done. Came looking good. Very true. Sometimes I think things can be regional... 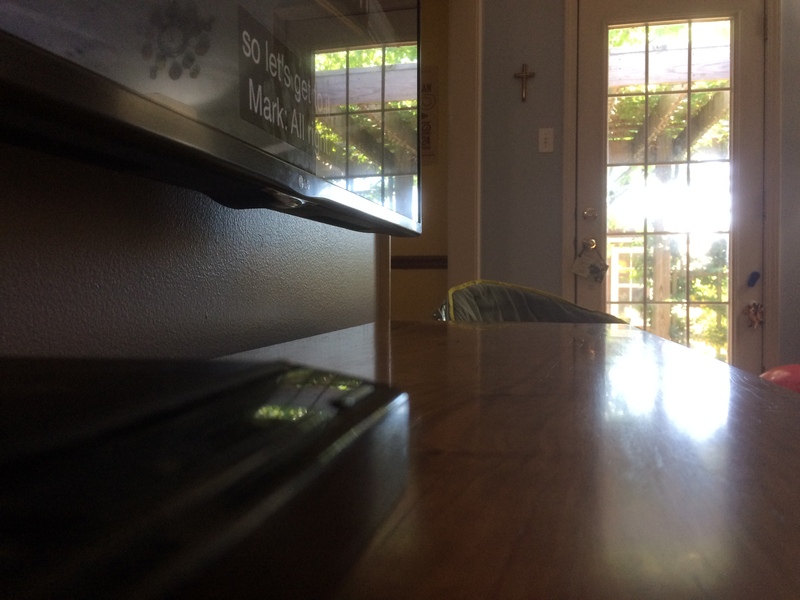 When I lived in Utah everyone had a rumpus room, in California everyone has a family room but they both served the same purpose. 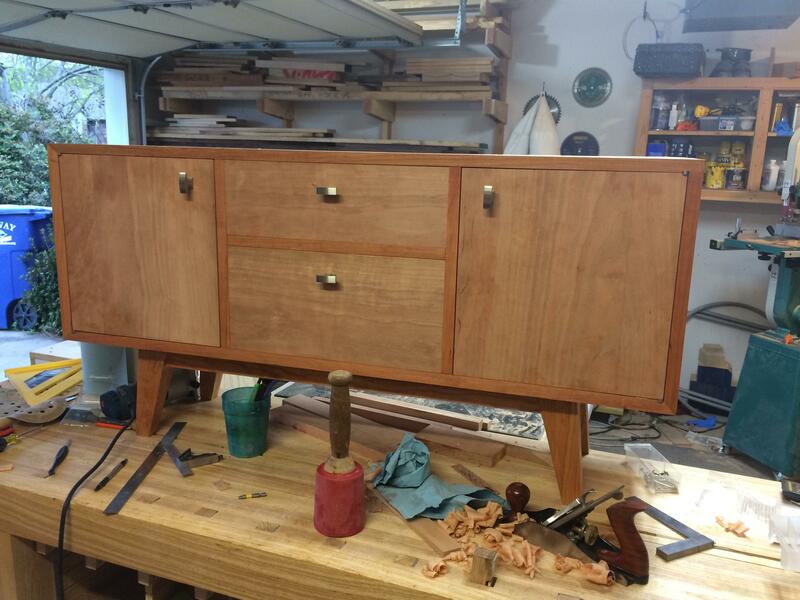 Credenza to me is just another wood for a side board or server depending on your region. It also only reminds me of that thing Marc just made and while the craftsmanship of it is wonderful i HATE the design. I can only see a fat man with his belly hanging over his belt. I hear ya on the entertainment center. 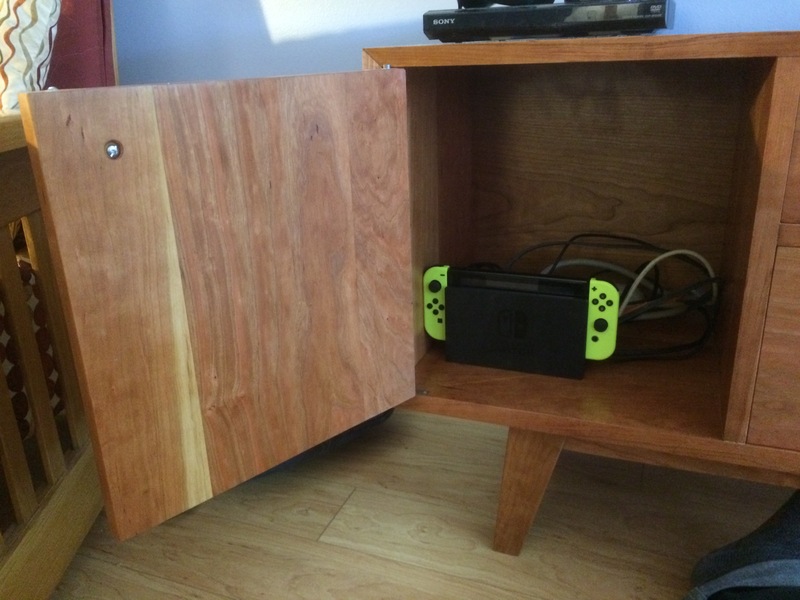 I'd probably call it a media console/cabinet but that still brings back memories of those awful overbearing pieces of furniture. I think a new name needs to be coined like Cabinet that sits under the TV and holds that outdated stuff you can't bear to part with . 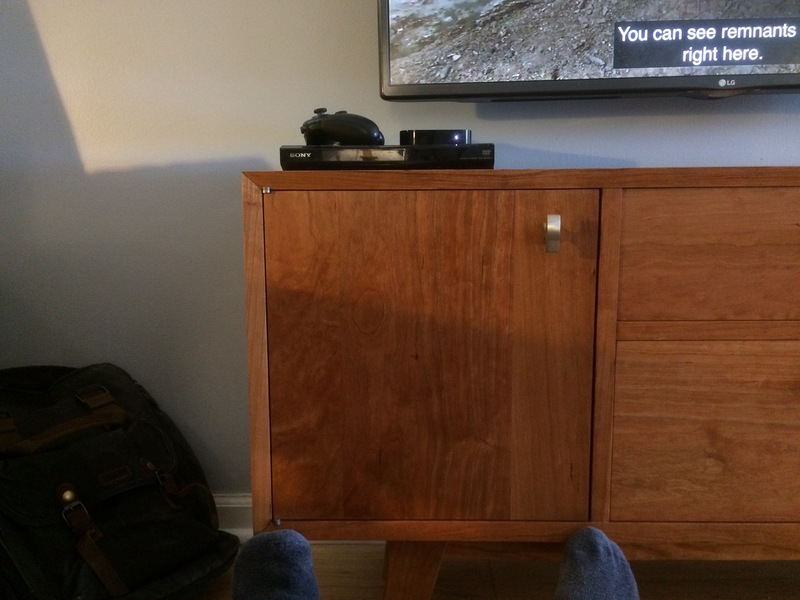 This was all tongue in cheek as i also made a TV stand where i wall mounted the TV above it. It's a common practice and a good one imo. Lets not go back to CRT TVs days and those overbearing cabinets that surrounded them. I can only see a fat man with his belly hanging over his belt. I have referred t omine as a media cabinet. 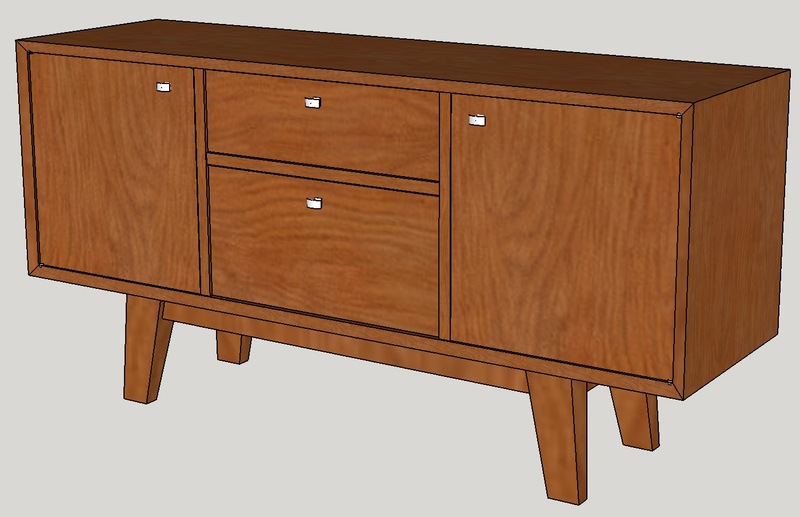 To me a Credenza is the "rosewood type" cabinet furniture piece that is behind an executive as he sits at his large rosewood desk.